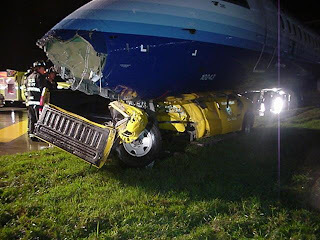 On 18 October 2008, at about 4:49 am, Three people were injured when a United Express Canadair Regional jet, operated by Skywest Airlines, collided with a maintenance truck on a runway at Chicago's O'Hare International Airport. 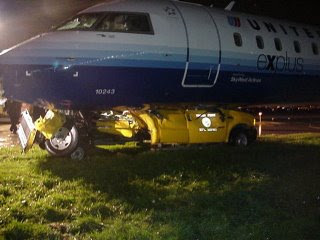 According to the Chicago Fire Department, the plane, which was being operated by a pair Skywest maintenance workers and had no passengers on board, was traveling from a hangar to a gate at when it collided with a pickup truck. The driver of the truck and the two mechanics from the plane sustained minor injuries. Although the incident closed a runway for about two hours, flight operations were not affected.